The site originally had two shrines built in the reign of King Taksin (1767 – 1782) by his Chinese supporters. 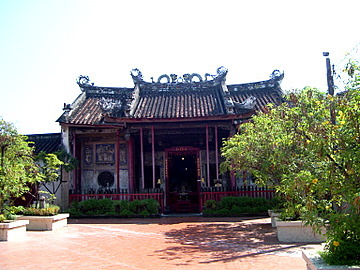 The dilapidated buildings were torn down in the reign of King Rama III (1824 – 1851) and rebuilt to house Kuan Yin, the goddess of mercy. Kuan Yin, an ancient Chinese goddess, embodies the virtues of love, kindness, compassion and forgiveness, a legend that goes back almost 3,000 years. She was Miao Shan youngest daughter of a Chinese king, who was blessed with virtue and spurned her corrupted father’s greed for wealth and power. When she rejected his order for an arranged marriage, he drove her out of their home. Rejected, persecuted and exiled by her father, she dedicated her remaining years as a nun healing the sick and destitute and as a savior of shipwrecked sailors. When her father was mortally ill, a monk advised him that this only cure was a medicine made from the arms and eyes of one pure in heart and free from anger. Miao Shan heard of this and sacrificed her eyes and arms for the potion to save her father. After the king was cured he sought out his benefactor in the mountain only to discover she was his daughter whom he had mistreated. He prostrated himself before her and begged for her mercy and forgiveness. As an act of atonement he ordered a monument for her. 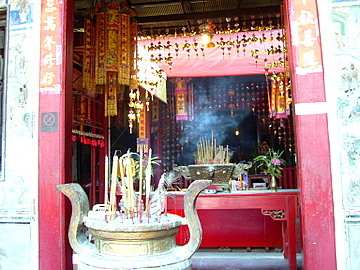 Her selflessness earned her eternal worship and the Kuan Yin Shrine became a Chinese cultural heritage. 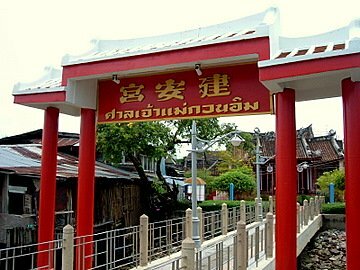 The early Chinese immigrants to Bangkok continued the tradition and built a shrine for the Goddess of Mercy on the Chao Phraya River near where they lived. Some versions of Kuan Yin, depict her with a thousand hands with an eye in each palm; a thousand hands to help those in need and a thousand eyes to see who are in need for one who has made the supreme sacrifice and attained enlightenment through compassion and mercy. An elevated walkway, a recent addition, runs from the pier along the riverbanks and a small footbridge with a red arch links the walkway to the main gate of the shrine. 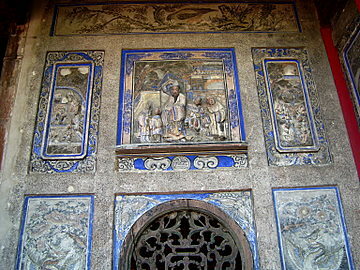 At the end of a small red-tiled courtyard is the period Chinese structure housing the Goddness of Mercy. There’s no one in sight. It’s almost like a scene from a historical Chinese movie. I half expected to be confronted by black-clad masked sword men leaping over the wall into the courtyard. 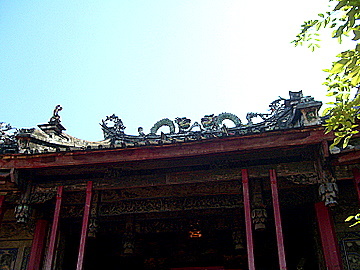 Two fiery dragons ride the crest of the roof, glaring down fiercely. The wooden doors in the sidewalls leading to the inner quarters behind are closed. 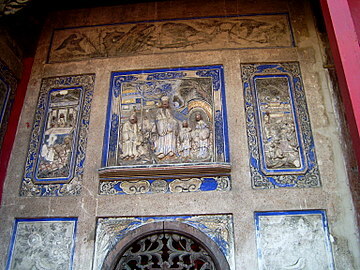 Images of classical Chinese characters are engraved on the front walls on both sides of the door. 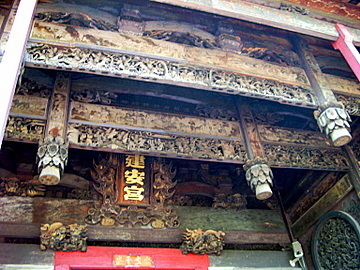 Above the opened main door, are elaborately carved lintels. No photographs are allowed inside the shrine. So will have to be the last shot. It’s not a busy shrine on non-festive days. The occasional worshipper comes in to pray and pay respects as the day goes lazily by. Life on the river is quiet except for a few children playing by the pier and the odd fisherman. The easiest way to get there is to take the Silom line skytrain to the S6 Taksin Bridge station. The Sathorn pier is below the station. From Memorial Bridge walk through the fresh flower market in Chakraphet Road to the Pak Klong Talat ferry pier. The ferry from the Pak Klong Talat pier will take you across the Chao Phraya to the Wat Kalayanamit pier. From there it’s less than a 100 m walk to the Kuan Yin Shrine. While you are there visit Wat Kalayanamit as well as the old Santa Cruz Church.